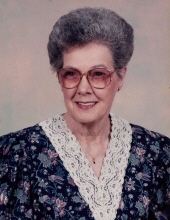 Mrs. Joyce Lawanda Archer, age 91, of Republic, Missouri, formerly of Thayer, Missouri, passed away on Monday, April 1, 2019 in the Republic Nursing and Rehab. She was born on September 5, 1927 in Sapulpa, Oklahoma, one of 11 children of Vincent Vandovel and Beurah Harriett (Roberts) Nickless. Joyce graduated from the Alton High School in May of 1945. She was united in marriage to Joe Hanford Archer on March 7, 1947, in Alton, and they enjoyed 64 years of marriage before Joe passed away on August 6, 2011. Others who preceded Joyce in death were her parents; and seven of the eight siblings, Lewis, Robert, Clifton, Mittie, Wilda, William, and Mary. Later Beurah married James C. Fuller and he, along with two half siblings, James and Donald Roy Fuller, also preceded her in death. Joyce had been a member of the Freewill Baptist Church in Thayer. She loved spending time in nature, bird watching, gardening, and planting flowers and trees. Joyce also enjoyed playing the organ, sewing, canning, and baking, especially cookies. She is survived by a daughter, Linda Griffin; two grandsons, Joey and Darren Honeycutt; five great grandchildren, Brittney, Kayla, Dylan, Erika, and Delaina Honeycutt; her last surviving sibling, Paul Eugene Nickless; numerous nieces and nephews; and many other relatives and friends. To send flowers or a remembrance gift to the family of JOYCE LAWANDA ARCHER, please visit our Tribute Store. "Email Address" would like to share the life celebration of JOYCE LAWANDA ARCHER. Click on the "link" to go to share a favorite memory or leave a condolence message for the family.